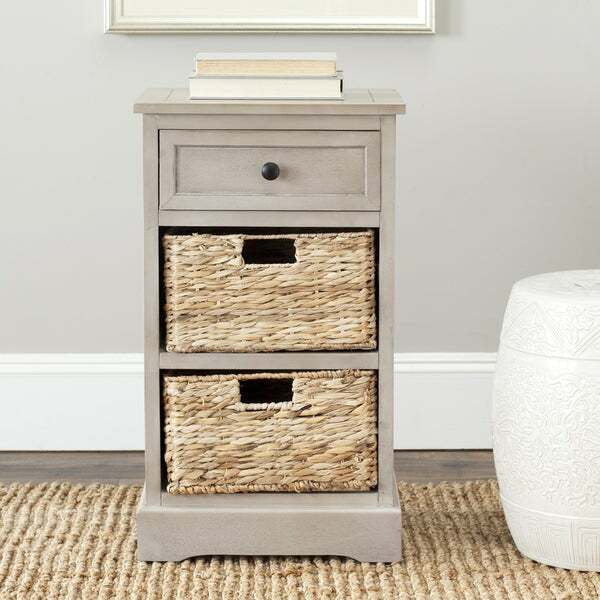 Safavieh Cape Cod 3-Drawer Cream Storage Table - 15.9" x 13" x 27.6"
Safavieh Halle Winter Melody 3-Drawer Wicker Basket Storage Unit - 17.3" x 13.4" x 29.5"
A carefree spirit infuses Safaviehs 3-drawer Cape CodStorage Table. One drawer for easy storage and two removable woven rattanbaskets with cutout handles make decluttering and cleanup a breeze. Handsomely crafted of durable pinewood with a vintage greyfinish, this table brings a coastal vibe to your bedroom, living room, ormaster bath. Its charming aesthetic and petite frame ensure that it will workequally well in a compact apartment or a spacious family room. Dimensions 27.6 in. H. x 15.9 in. W. x 13 in D.
Baskets are pretty good quality but there isnt a full divider/ shelf between the levels. I can imagine that once I start to use this product and have stuff in the top basket that bad things are going to happen. This products is sturdy but its a little on the cheap end. Overall I like this piece and I would order it again. Just like the other Safavieh that match this table, I love it! It's made well and perfect for my décor. The price is great and the storage is fantastic! I love these pieces. I bought two of these tables for my 88 year old Mother's new apartment with a matching coffee table. They are well made and have plenty of storage space. This feature was important as the living room is rather on the small side and the storage space was important. The table is good quality, the color is nice and looks exactly how it did on the site. The only issue I have is with the drawer, it doesn’t slide easily at all. If you won’t be using the drawer much it’s probably an issue but my purposes for the table difficulty opening the drawer was problematic. I ordered this Aling with 2 of the double Column storage tables after redecorating my daughters bedroom in shades of grays and white. I am in love with the usefulness and beauty of these pieces at such an affordable price! Love this end table/ night stand. Its well made, durable, adds a beautiful touch to my bedroom. The only difficulty with this cute item is that the drawers do not slide easily. Other than that I love it! I love this storage table for a small corner in our upstairs landing. I put hand towels in it and it looks great and is very neutral. It was slightly damaged upon arrival but not enough to send it back. These are great and sturdy! We love them! Great size, color and 2 good reviews! "Is the depth of this piece accurate? It seems WAY too deep from the photo?" Hello hazeyjane1, unfortunately this item is out of stock. We currently do not have inventory to check, and cannot guarantee the item will be restocked. Thank you for shopping with us. "In the review, the person says: "there isnt a full divider/ shelf between the levels. I can imagine that once I start to use this product and have stuff in the top basket that bad things are going to happen." What holds up the top basket? This comment wasn't clear to me. Thanks." Thank you for your inquiry. The storage table center shelf is hollow but have an outer ring for the rigid baskets to sit on.